CNG: Printed Auction Triton XIX. HUNNIC TRIBES, Alchon Huns. Toramana. Circa 490-515. AV Dinar (18mm, 9.53 g, 12h). Triton XIX, Lot: 2177. Estimate $5000. Sold for $10000. This amount does not include the buyer’s fee. HUNNIC TRIBES, Alchon Huns. Toramana. Circa 490-515. AV Dinar (18mm, 9.53 g, 12h). 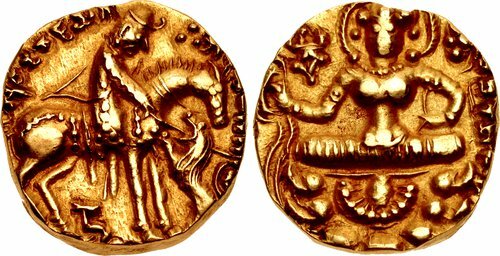 Parahitkari [raja] vijitya [va]sudham divam jaya[ti] in Brahmi, male figure wearing Hunnic-style crown on horseback right, bow slung across torso, spearing lion that stands left on its hind legs; Garuda standard above, ru in Brahmi below; triple pellets in legend / [Śri] prakaśaditya in Brahmi to right, Lakshmi, nimbate, seated facing on lotus, holding diadem in extended right hand and lotus in left; tamgha to upper left. P. Tandon, “The Identity of Prakāśāditya,”Journal of the Royal Asiatic Society 25.4 (October 2015) pp. 647-668 (reattributing the issue to Toramana), and fig. 1 (this coin); BKB 222; BMC Guptas 552 corr. (tamgha); Altekar 2; Bayana 13; Sunrise 555. EF. From the collection of Dr. Lawrence A. Adams. Ex Gemini II (11 January 2006), lot 195; Spink 71 (11 October 1989), lot 1020. This issue has traditionally been attributed to a ruler named Prakasaditya, who has been placed with the Guptas. While the types have parallels to certain Gupta issues, the shape of the horseman’s head and the type of headdress he wears have a clear affinity with issues of the Alkhon Huns. This had led to a debate among scholars, with a minority advocating that it was actually a Hunnic issue. Compounding the problem is the fact that the most accessible of these coins have been struck on compact flans, obscuring most of the letters of the name in the obverse legend. Recently, though, this debate came to a conclusion with Pankaj Tandon’s discovery of a coin in a provincial museum in India with the full obverse legend visible. This coin clearly showed that the issuer was the Hunnic king Toramana, and the word Prakasaditya is an epithet for him.